LBZ-LU Series Automatic Blow Moulding and Plastic Sucking Lid Forming Machines are development pensonnel in light of the demand from packaging market .In combination with the advantages of aluminum-plastic blister packaging machine and plastic sucking forming machine,this machine is a new type product developed in light of pharmaceutical standard GMP and food standard “QS” . This machine adopts a fully automatic flow covering blow moulding or plastic suction moulding , punching and die cutting as per the special properties of products required by the users. It enjoyes advanced technology, and safe and simple operation, which will avoided the consumption of labor on the manual punching and contamination from touch with the employee .Therefore, the quality requirement is secured during the product production. Aligned heating is employed by the equipment, and it enjoys low power consumption, small covering of land. It is economical and practical,widely applied to the production in food, medicines and hardware. 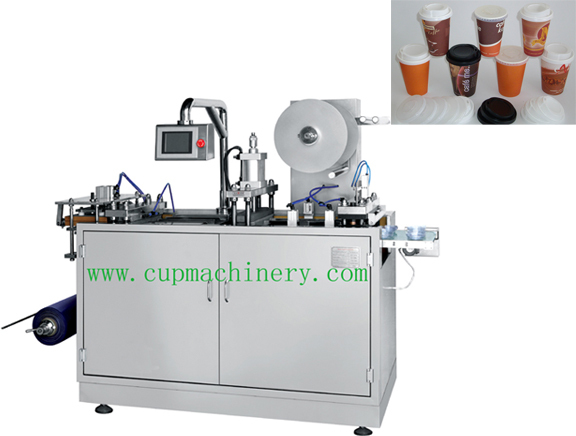 It is also applicable to the plastic ware such as PVC, PET, PE and PPmedicine trays, and cup lid thermoforming box. It is greatly favored by the users at home and abroad . 1. Speed reducer, main-rotating connection, main shaft are on line (to decrease driving error) for mechanical transmission. 2.Sensor controls are adopted in pneumatic system .PLC control makes the whole machine run smoothly, keeps synchronous stability during the products are to be packed in multi-labor, long- distance . 3. Main motor non-stop speed regulating ,the travel adjustable at will, simple and convenient to change the mould,manipulator traction , stable running . 4. May according to the product need, choose the positive pressure formation or the negative pressure formation in the equipment, achieves the best formation effect. Raw material: HIPS PVC PET PS ETC.